While the business of buying and selling self-storage properties has become much more complex than in years past, the discussion always ends up focusing on market capitalization rates. This summary will help clarify this mysterious yet fundamental concept. In 2018, the business of buying and selling self-storage properties has become much more complex than in years past, but the discussion always ends up focusing on market capitalization (cap) rates. Unfortunately, most people don’t fully understand all the ramifications of this seemingly simple calculation. Hopefully, this summary will help clarify this mysterious yet fundamental concept. Real estate valuation is a very complex business, with many variables affecting price. Over the years, professionals found they needed a way to compare property values within a market using a shorthand method, thus cap rates came into general use. Essentially, a cap rate tells an investor what he should expect to earn as a percentage if he purchases a property using all cash. For example, if he thinks a property is worth a 7 percent cap rate, then he expects to receive an unleveraged 7 percent cash-on-cash return. When you divide net operating income (NOI) by the cap rate, voilà! You arrive at a property value. The lower the cap rate, the higher the value; the higher the cap rate, the lower the value. This method is basically a way to develop a price based on an income stream. It’s one of three methods used by appraisers to value a property, but it’s the one investors focus on the most. It’s primarily used because it does a very good job of correlating property values and helps facilitate comparisons between properties and markets. As with any good rule of thumb, there are certain assumptions implicit in the calculation of self-storage NOI. For cap rates to be useful and comparable—and to compare “apples to apples”—the NOI must be calculated consistently on all properties. The first assumption when calculating NOI is all revenue must result from reoccurring operation of the facility—rental revenue, late fees, truck-rental commissions, tenant-insurance fees, etc.—and not from an asset sale or insurance recovery. Second, depreciation and debt service shouldn’t be deducted from revenue to arrive at the NOI. These assumptions are clearly defined and almost universally applied. However, assumptions related to operating expenses are less uniformly applied and result in significant misunderstanding, particularly among sellers. Buyers’ and sellers’ assumptions should include that the property is properly insured and managed in a professional way. Property taxes should be adjusted to what the new valuations will be at the time of sale. Advertising costs should be in line with market averages, even if the property is 95-plus percent full. Further, the expense numbers need to reflect the market labor cost of running a self-storage property, which should include an onsite manager’s salary, even if the owner is currently doing the work for free. It’s also assumed that operating expenses will include an offsite management fee over and above the manager’s salary. This will range from 4 percent to 6 percent of gross revenue, depending on property size. Many owners will say some of these assumptions don’t apply to them for various reasons. I can assure you, however, that there are almost no exceptions in the marketplace of real sales. In the end, ignoring these assumptions is self-deception at best and, at worst, can have a serious impact on the financing or sale. Not all properties are alike, and they can command different cap rates. The variations in rates (typically 5.5 percent to 8.5 percent) usually reflect the quality of the physical project, the market in which it’s located and the inherent risk to the buyer/owner. For example, a 40 percent vacant metal-building project in a rural area would require a higher cap rate to reflect the increased risk and lesser quality. On the other hand, a large masonry project with security measures and consistently increasing rents in a growing metropolitan area would command a premium cap rate, perhaps in the 5.5 percent to 7 percent range. Again, while the cap rate may vary, the underlying assumptions about the NOI don’t. Property valuations are somewhat subjective, but knowledgeable buyers and sellers agree the quality of the asset and the consistency of the NOI will lead most serious investors to a value in a very narrow range of cap rates. Do cap rates really reflect the market? The answer is unequivocally yes! If cap rates didn’t reflect the marketplace accurately, we wouldn’t use them in so many ways. 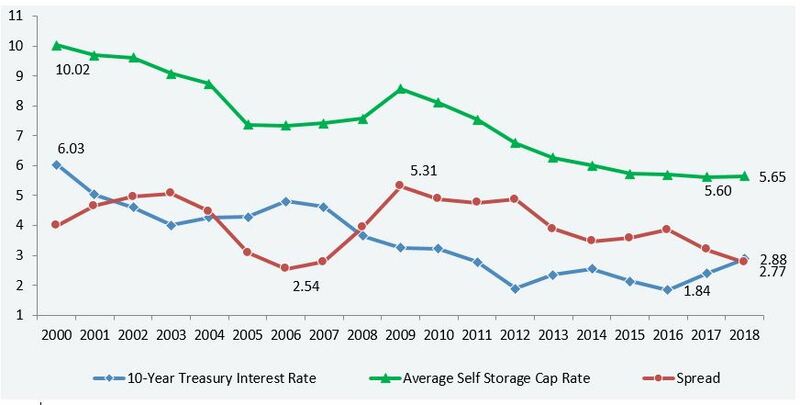 The following chart gives you an idea of how self-storage cap rates have varied over the last 18 years. This takes into consideration all properties nationwide; but bear in mind that a property in a small city or town won’t command the same low cap rate as one in San Francisco or midtown Manhattan. As you can see, the market has seen a constant decline in cap rates, from an average of 10 percent in 2000 to 5.6 percent in 2018. This is largely due to the steady performance of self-storage assets and an improvement in available industry data. The data indicates the overall risk associated with owning self-storage is much less than once thought, not to mention we’ve had a great run of low interest rates for the past decade, which has fueled the increase in value for almost all income-producing real estate. The most intriguing metric is the spread between cap rates and interest rates, indicated by the red line. The narrowing of the spreads indicates the market is once again realizing that self-storage income streams are very durable. Hopefully, this review has clarified the basics of how cap rates they work and their effect on valuation. Remember, to arrive at an appropriate valuation using a cap rate, you must be impartial when making the required adjustments to revenue and expenses. You must also review recent sale comparisons in your market and understand the current debt markets to ensure you’re not misleading yourself on the value of your property. If you’re thinking about obtaining professional advice when evaluating a self-storage facility, it’s important to consult with a real estate professional who specializes in the asset class. Understanding and setting property value is the single most important step in the investment process. Ben Vestal is president of the Argus Self Storage Sales Network, a national network of real estate brokers who specialize in self-storage. Argus provides brokerage, consulting and marketing services to buyers and sellers via an extensive marketing platform for self-storage properties. Property listings and informational resources can be found at www.argus-selfstorage.com. For more information, call 800.55.STORE; e-mail bvestal@argus-realestate.com.